In a previous post, I demonstrated a convenient way to make a wait cursor show up during “reasonably” long operations (up to a few seconds). For anything longer than that, though, a wait cursor won’t cut it — for one thing, your UI will become unresponsive. For another, there is no way (other than killing your app) for the user to stop a long process. There are tons of different ways to provide feedback and cancel options, but until .NET 4.5/4.6, they were all a little bit kludgy. Now, thanks to async handling, it is possible to provide progress, keep your app responsive, and to do it in a way that is quite elegant. The reason for the loop and the smaller sleep duration (rather than just sleeping for 20000 milliseconds) is so that we can easily report progress by updating the progress bar, and also so we can check to see if the user has hit the cancel button. This will be more obvious in a bit. Almost all of the handling takes place in the button click handler. I’ll show the full code first, then break it down. We technically don’t need to update the label either, but it will make the explanations simpler. There are two really important things going on with this code. First is the presence of the “async” keyword in the method signature. This tells .NET that this method is going to make some sort of asynchronous call. Second is the “await” in front of our call to SlowProcess(). If SlowProcess() was just a regular method (it’s not, but we’ll come back to that), you could easily imagine that this code would work fine without the async/await calls. The label would change to Working, the work would be done, then the label would be changed to Done. However, our UI would be completely locked during the SlowProcess() handling because the system would not get any cycles. But there is something strange going on here — if you just launched a new thread, once the item was queued, execution would continue on to the next line of code. The label would change to “Working”, then almost immediately change to “Done”, because launching the work on a new thread takes almost no time. Of course, nothing is really done at this point — the work is going on in another thread. With the old mechanisms, that thread would have to signal back to the main thread when it was really done, and it couldn’t just update the UI because you would get a nasty cross-thread error (you can’t update UI elements created from one thread in another thread). User clicks on the button, causing the button_Click method to be called. Label is changed to read “Working”. Thread is launched to execute the SlowProcess() code. Control is returned from the button_Click method, meaning that processing can continue. At some point in the future, SlowProcess() completes. Call is made back into the button_Click method, immediately after the async call. Label is changed to read “Done”. There are also ways in which we could have launched work on multiple threads simultaneously, and the code would have auto-magically continued only when all of the work was completed. That is beyond the scope of this article, but the power of async is really impressive, and we are just scratching the surface right now. Where prog is a reference to our Progress<int> object and i is the loop variable we are using that indicates how far we are in to the process. When Report() is called, a call is made to SetProgress, automatically marshaled to the correct thread. SetProgress() then just updates the progress bar’s position. 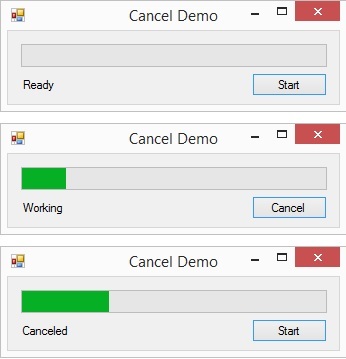 If you never check for a cancel, then you will never cancel! Note that there are some additional useful things you can do with a CancellationToken. For example, you can set up a time limit after which, if the operation is not complete, cancel should happen automatically. This makes it a little clearer as to what is going on. There are also various situations where having access to the Task is useful. For example, if you want to wait for the result of multiple tasks before moving on. Note that the method now returns Task<int> instead of just Task, and there is a return statement in the Expression. Hopefully with real code, the return would actually be based on some actual process, rather than hard-coded, but you get the idea! If we didn’t need access to the Task. That is because the system wants you to catch exceptions inside of the Task expression, and is warning you that you did not. However, if you do add a try/catch to the expression, then the exception will not be thrown inside of the button_Click() handler, and the only way you could tell that the operation was canceled would be by interrogating the status from the Task, which makes the code flow less well. I am told by someone at Microsoft that they are looking into ways to address this issue, but that it is extremely difficult to address without having a big impact on performance. 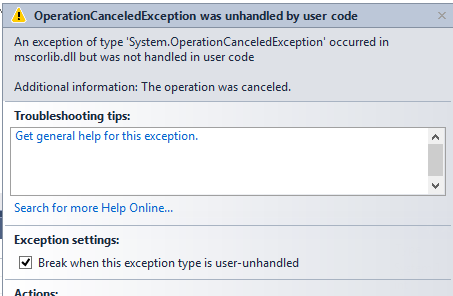 In the meantime, you can just ignore the exception (either explicitly, or by unchecking the “Break when this exception type is user-unhandled” checkbox. The fact that the explanation for what we have done is so much more complex than the code itself gives an idea of how powerful .NET async is. Given that most new processors are based around multiple cores, rather than raw speed, using threads will be the only way to take advantage of the machines’ power. While it has always been possible to hand-roll threading code (something I have done a lot of, sad to say) async lets you encapsulate the work without having to worry too much about the behind-the-scene details. Just think about what we are doing in this example — we have work going on in another thread, we are not locking up the UI, and we are showing progress to the user and allowing the user to cancel the operation. Not only is the code to do this simpler than it would have been before, but it follows standard patterns that should make it easier for other developers to maintain. You can download a solution with the example code here. I have a long running method but unfortunately it doesn’t have any loop and it can’t have one. Is there any solution for such scenario. What I have understood from above example is that long running loop must know when to exit the flow on cancellation of passed token. It is hard to answer that generically, but you just generally need to call ct.ThrowIfCancellationRequested(); often enough to make the UI responsive to the cancel request. If you just have a lot of procedural code, you can litter it with calls. On the other hand, if your code is calling another long-running process, that can be tricky to handle depending on what sort of process it is (ex: if you are making a web request, you can kill your end, but you can’t really kill the actual request).